A man in his 60s has been airlifted to hospital after he was seriously hurt in a car crash. Emergency services were called to reports of a car in a ditch on the A15 Market Deeping bypass at about 1.50pm this afternoon (Tuesday). 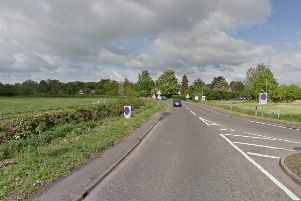 A Lincolnshire Police spokesman said the man had suffered serious injuries after hitting a tree and the dual carriageway section of the road was closed in both directions so an air ambulance could land. A Lincs and Notts Air Ambulance crew then flew the man, in a serious but stable condition, to Queens Medical Centre in Nottingham for further treatment.